North Korea’s head of state Kim Yong-nam will go to PyeongChang this week for the Winter Olympics. Kim Yong-nam, 90, is the most senior official to ever visit South Korea. North Korea confirmed his attendance at the opening ceremony, set for February 9. Both Koreas will march under one flag at the opening ceremony. Although Kim Yong-nam’s attendance at the Winter Olympics signals a thaw in relations between the Koreas, experts say it is unlikely to have any impact on North Korea’s nuclear ambitions. 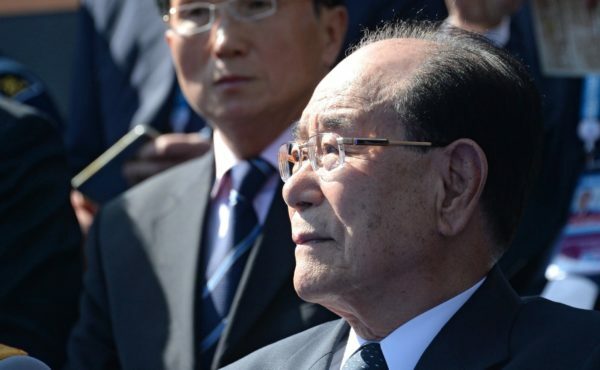 Kim Yong-nam will be in South Korea for a three-day visit and will lead a 22-member delegation. He has seen the rule of all three North Korean leaders in his career. Kim Yong-nam is the ceremonial head of state who receives credentials from foreign diplomats in Pyongyang. As such, he is usually responsible for sending condolences or congratulatory messages to foreign leaders. He has been the president of North Korea’s rubber-stamp parliament, the Supreme People’s Assembly, since 1998. Unlike North Korean leader Kim Jong-un, Kim Yong-nam has traveled abroad on official visits. In August 2017, he travelled to Iran to attend President Hassan Rouhani’s inauguration ceremony for his second term in office. Kim Yong-nam also attended the opening ceremony of the Winter Olympic Games in Sochi, Russia in 2014. He is said to be a loyal follower of the top leadership. “As Kim is known to be acting and speaking under the country’s guidance, he makes no mistakes. That’s why he could keep his high-level post in a country where political purges are common,” South Korea’s Yonhap news agency quoted one North Korean defector as saying. South Korea has said it will seek high-level talks with the North Korean delegation during the visit, Yonhap reported. Kim Yong-nam’s attendance at the opening ceremony will also put him in the company of Vice President Mike Pence, at a point of high tension with Washington over North Korea’s nuclear ambitions. On February 4, the Washington Post reported that Fred Warmbier, whose son Otto Warmbier was jailed by North Korea and died days after returning to the United States, would attend the opening ceremony as a guest of VP Mike Pence. Fred Warmbier and his wife, Cindy, were guests of President Donald Trump at last week’s State of the Union address. On February 5, North Korea proposed sending an art troupe to the Games by ferry, a move that would require an exemption from bilateral sanctions. According to South Korea’s unification ministry, Pyongyang proposed that its delegation use the Mangyongbong 92, a ferry that usually operates between North Korea and Russia, for transportation and as accommodation for the group. All North Korean ships have been banned from entering South Korean ports since 2010. On February 4, the united Korean women’s ice hockey team played its first match, but lost the friendly against Sweden 1-3. The outing was the first and only practice match for the newly minted Korean squad. As well as the ice hockey players, North Korean athletes will compete in skiing and figure skating events. It is also sending hundreds of delegates, cheerleaders and performers. North Korea currently faces growing international pressure and sanctions over its nuclear and missile programs after it conducted a series of missile tests designed to demonstrate its nuclear capability. Its participation in the Olympics, which run from February 9 to 25, was an unexpected warming of ties. Meanwhile, although South Korea and the US have agreed to delay the annual big joint military exercises which always enrage North Korea, they will still go ahead at the end of the Paralympics.